Author’s Note: This essay discusses in part Nicholas Ray’s film ‘Johnny Guitar’. I rarely caution against viewing films, yet unless you feel it is completely necessary, skip ‘Johnny Guitar’. Plainly, this is a poorly constructed and acted film. If you want to watch an excellent Ray film, I implore you to make ‘In a Lonely Place’ a priority. That film is highly disturbing and in my estimation contains Humphrey Borgart’s greatest performance. Women on the Verge of a Nervous Breakdown(1988), directed by Pedro Almodovar, introduces a surprising and refreshing take on how women are represented filmically. The film uses the American melodrama Johnny Guitar (1954) as the genesis for the tale of heartbroken Pepa(Carmen Maura). From an American tale of heartbreak and loss emerges a story of female empowerment this is distinctively Almodovar. Vienna(Joan Crawford) from Johnny Guitar is used to parallel the life of Pepa. Vienna is a strong woman who struggles to gain her financial independence without a man. Pepa used her own talents to further her career, but her lover was at her side for a portion of the time. The fact that Ivan(Fernando Guillen) and Pepa are dubbing Johnny Guitar at the time of their breakup is used to remind Pepa of her sadness and how life cannot always imitate the movies. In Johnny Guitar, Vienna plays it sly with Johnny(Sterling Hayden), until she finally breaks down. She does not want him to think she was waiting for him, even though she was. Pepa, on the other hand, calls Ivan several times with the desperation of a dying woman. Even though Pepa is much better off(financially, socially, and in relation to gender roles) than Vienna, she acts much more impulsively and erratically due to her broken heart. The contrast of these two female leads is stunning when viewed in the context of time and history. The character of Vienna exists in the outlaw West, yet owns her own business, is the boss of several men and wears pants. To pull back even further, this film was produced when women did not have many career aspirations, would not have been the boss of men and rarely wore pants. Pepa, conversely, is a successful woman living within the relatively open space of post-Fascist Spain. Pepa’s behavior seems like a throw-back to olden times, especially since she wears a series of dresses, tracks down her lover’s other woman and throws tantrums involving fire and beds. The way that Vienna and Pepa ultimately deal with their men is divergent from what is expected. Vienna takes back Johnny, after some resistance, despite his unexplained absence. Pepa decides to forsake Ivan, even though she is pregnant with their baby. Conventional wisdom would dictate that since Pepa was so obsessed with Ivan, she would take him back. Yet Almodovar gives Pepa a modern spirit by allowing her the right to her own life. Pepa’s declaration of independence from Ivan is meant to illustrate that women should not take back dishonest men, even if they love them. One can ponder that Vienna really wanted to be rid of Johnny the second time around, but since this was a film set in the 1840’s and produced in 1954, this was not a viable option. 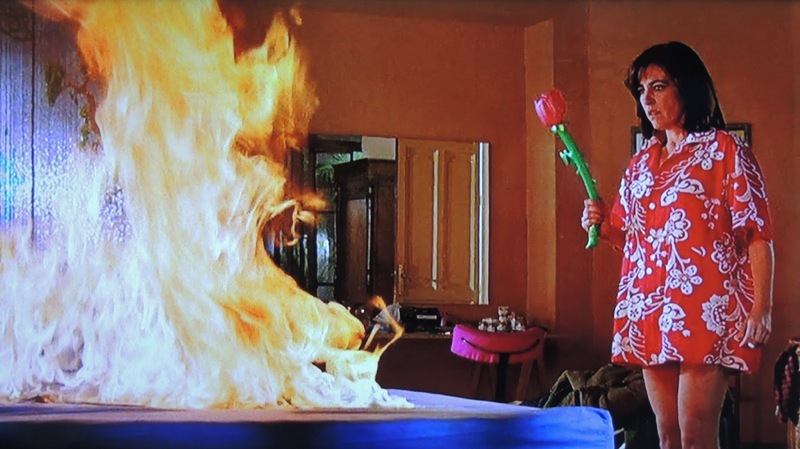 Almodovar allows Pepa the ability to express her violent emotions toward Ivan through such acts as spying, spiking gazpacho and throwing phones. Pepa realizes that reconciliation with Ivan would only jeopardize her happiness and that of the pending child. One of the probable messages that Almodovar was trying to convey by departing from the Johnny Guitar model, was that women should not stay beholden to toxic men. The majority of men in Women are less than stellar fellows. Ivan is a womanizer and his son Carlos(Antonio Banderas) appears to be a fledgling one. The Shiite terrorists, the police and even the mention of the “Crossroads Killer” shows that Madrid is not populated by savory men. The telephone repair man and the Mambo Taxi driver are the only benevolent males that are found along the way. The female characters of Women are not saints by any means, but are made to look more sympathetic than the men. The women’s misery and dissatisfaction is shown as a by-product of their relationships with distrustful men. Pepa is crazed because of how Ivan treated her. Candela(Maria Barranco) is a wreck because of the terrorists and as she says, “Look how the Arab world treated me. I sure didn’t deserve that.” Lucia(Julieta Serrano) is particularly dejected, due to her psychosis, which was partially caused by Ivan. Even Marisa(Rossy de Palma) is more fulfilled sexually by her own mind, than by her stuttering fiance. The tragedy of women’s lives is a topic that Almodovar embraces with warmth and understanding. Pedro knows that in our secret fantasy worlds we may want Johnny Logan to sweep us away, but this is not a healthy situation. Almodovar gives us what we need, which is a portrait of a woman who can overcome heartache and still prevail in the long run.